Evenings mean homework, games, and other school functions so having quick-and-easy weeknight meals to prepare is a must. 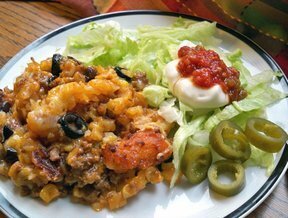 This Mexican-style tater tot casserole combines a family favorite with the added taco flavoring. It can be made the night before and then popped in the oven the next night while the kids are finishing their homework. When they are done their supper will be waiting. See how to make hot chocolate mix for an after-school treat or to take to the school football games to keep you warm. See how using a squeeze bottle makes it easier to cook pancakes and store the leftovers for the next morning.